Hanoi(VNA) – Vietnam’s garment-textile sector is expected to expand its markets once the Vietnam-EU Free Trade Agreement (EVFTA) comes into force in early 2018, reducing tax on Vietnamese garments and textiles exported the EU to zero percent over the next seven years. To make use of opportunities offered by the pact, experts suggested local enterprises prepare to meet rules set by the deal, especially those regarding product origin. Europe is a promising market for Vietnamese garments and textiles with export turnover reaching 3.5 billion USD in 2016, just behind the US. Truong Van Cam, Vice President of the Vietnam Textile and Apparel Association (VITAS), described rules of origin as the most important thing in the agreement. 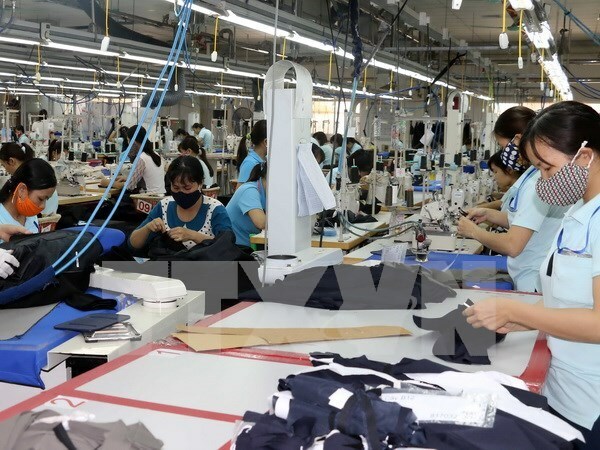 He said, Vietnamese garment-textile firms must ensure that their products originate from Vietnam or use materials imported from the EU or the bloc’s trade partners. The local garment-textile industry is still heavily dependant on imported materials , mostly from China, the Republic of Korea (RoK) and Taiwan (China), with the fabric sector, for example, importing up to 86 percent of materials for production and export. VITAS Deputy Secretary General Vu Thi Phuong suggested domestic enterprises review their investment and business strategies to catch up with the transformation from the cut-make-and-trim production model to free-on-board and original design manufacturing (ODM) practices. According to Phuong, apart from strict rules, the agreement also offers an open mechanism to the Vietnamese side, saying that products using materials from the EU’s partner countries will also enjoy the tariff breaks. Under the agreement, fabrics from the RoK, which has a free trade agreement with the EU, are considered as having clear product origin and are eligible for the tax reduction. VITAS statistics show that the garment-textile sector spends more than 10 billion USD each year on importing fabric, with more than half from China, about 18 percent from the RoK and 15 percent from Taiwan (China). If Vietnamese firms continue to import materials from China, they will find it hard to benefit from the EVFTA, the association said.